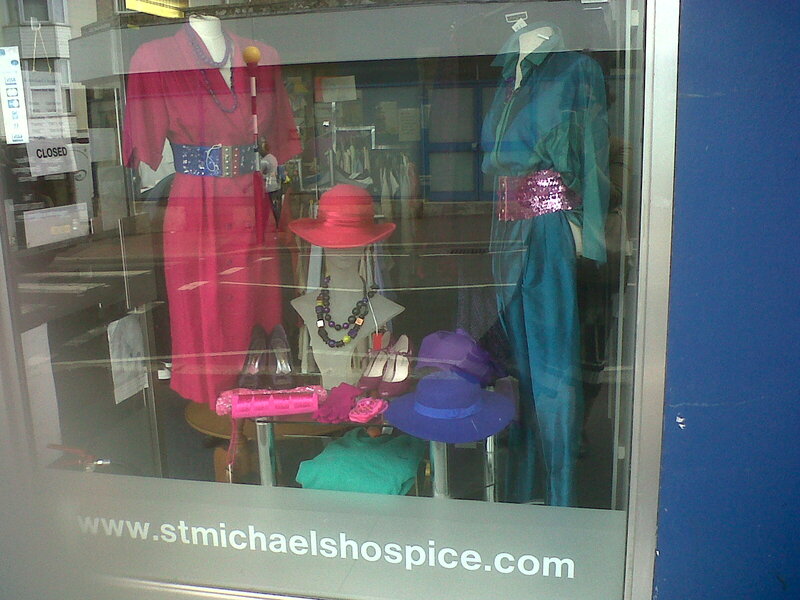 Despite the reflective window (the sun was glorious on that day), I hope this photo still shows off my equally glorious 80s inspired display ... pinks, emeralds, purple & royal blue ... all the colours my mum was desperate for me to wear during my black and grey phase ... so Muddel, this is dedicated to you! There is the double breasted pink linen dress with the shoulder pads (whoohoo! ), the shimmering green shantung silk top and trousers, the pink & blue felt hats, pink sequined and satin clutch and some chunky necklaces .. Does anyone remember the film "Mannequin", where supersweet Andrew McCarthy (he was so hot in Pretty In Pink) falls in love with his mannequin while on a window dressing job ... the doll strangely coming to life, being KIM CATTRALL of all people! Extraordinary! Maybe I should let myself be locked in one afternoon at the St. Michael's shop ... I wonder who my two headless dummies could turn into ... hmmm, ok, let's not go there!